A couple of weeks ago, I tracked down Miriam Lipton, the new owner of a wine and beer bar coming to the Tenderloin. At the time, she wanted to wait on releasing details since she was applying for her license with the ABC and was about to send out her letter of notification to the local residents and Board of Supervisors. But since the cat was let out of the bag, she gave me the go-ahead to share some information. Lipton is opening ~TENDER~ in a small, narrow space at 854 Geary, at the base of 850 Geary. Her ex-husband, Craig Lipton, owns the building and has been actively transforming it from its previous state, which was pretty bleak. It ends up there were two commercial spaces available, both of which have been vacant for more than 40 years, and Lipton is opening Tender in one of them. She says one of the biggest contributors to the blight of the neighborhood is all the unused spaces, so she is excited to bring it to life. Tender will feature 20 wines on tap plus a few sparkling wines (in bottle), with 4-6 beers (all stored in the back, with lines running to the bar in the front). She said she will be choosing quality wines, mostly from California, but you won’t find an ounce of pretension. Lipton is very enthused about wine on tap, citing the environmental advantages and the fact you can pour all kinds of sizes, from tastes to carafes. But she also remembers her days living above the Savoy Tivoli in North Beach and having to hear all the bottles clank into the garbage trucks at the end of the night. Wine on tap is totally, blessedly silent. There will also be local cheeses and charcuterie available. The space will have seats for six at the bar, while the majority of the seating will be at banquettes along the wall. There is also a mezzanine level, which they hope to make into a loungy space with dark leather seating and rotating art shows. Speaking of art, she is also bringing on artist Andrew Schoultz (known for his trees) to do a mural for the space. The opening date is totally contingent upon ABC license approval, but Lipton hopes to open in the spring. Potential hours will be 3pm or 4pm-11pm, hopefully later Thu-Sat, as well as 2pm-10pm on Sun. 854 Geary St. at Hyde. Looks like this sign will be moving. Photo from Facebook. 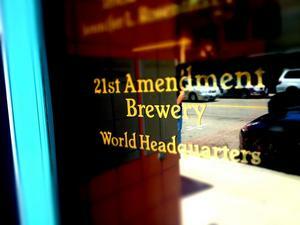 After six years of partnering with Third Street Brewhouse in Minnesota for most of their bottling and production, local brewers ~21ST AMENDMENT~ have found a facility here in the Bay Area. They’re planning to open a 95,000-square-foot facility in a former Kellogg’s Cereal plant in San Leandro, which will greatly increase their capacity for bottling. They’re hoping to open the new location later this year, followed by a tasting room and retail space in 2015. The new location will also serve as the brand’s world headquarters. (Hat tip to Scoop.) 2010 William St. at Doolittle, San Leandro.